And here are our Honorable Mentions: @karla.isabel, @neuhart125, @___kimberlytran, @qcheezy, @agent328, Kathy G., Tina S., Carrie Van T.
Take part in our #ItsNotThatSpooky Halloween Costume Contest Friday, October 13 – Tuesday, October 31. You can save lives in style and win a WICKED MAJOR PRIZE witches will envy. How does winning 4 one-day passes to San Diego Comic-Con International sound? How about a GoPro valued at $549? Or a San Diego staycation package…on us? Here are the spooky easy rules to win! If you've got it, haunt it. 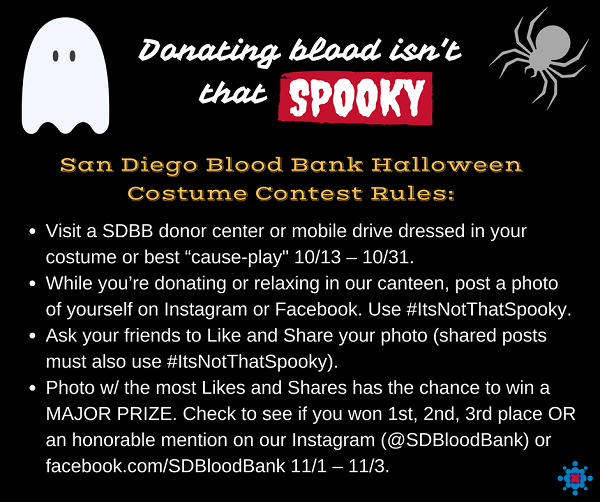 Donate blood because it’s not that spooky! Make your appointment to donate blood.